Welcome to the Dorset Coppice Group website. Don't forget to try our interactive members' map. 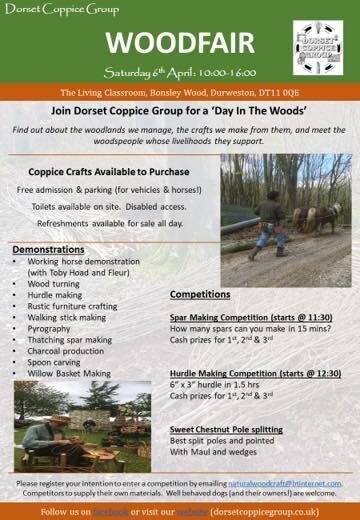 Dorset Coppice Group is pleased to announce details of our annual Woodfair 2019, which will be held on Saturday 6th April at Bonsley Wood. Admission is free, dogs (and children!) are welcome and refreshments will be available. Come along and take a look at what we do and explore the beautiful woods in which we work. The spring flowers should be out in full force! Remember that we hold monthly volunteer Work Parties on the 2nd Saturday of each month, at The Living Classroom at Bonsley Wood. These run from approximately 10am – 4pm and involve a range of tasks from woodland management, to Classroom maintenance and wood processing. All tools are provided (although you are welcome to bring your own) and we try to provide a soup and roll for lunch. This is a great opportunity to meet other members and play a more active role within the Group. Hope to see plenty of you there? If anyone who is planning to go would be able to spare some time to help out with the Bar, please contact Peter Jameson on charcoalpeter@gmail.com. 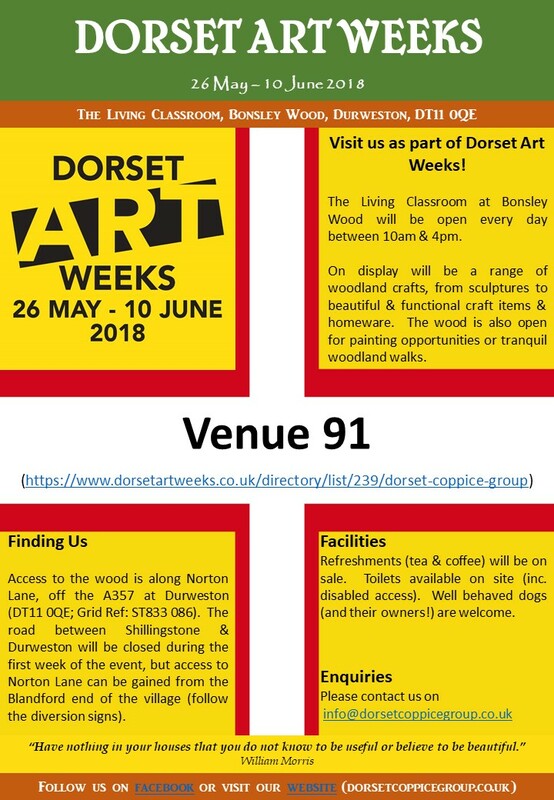 Dorset Coppice Group is taking part in Dorset Art Weeks, which runs between 26th May & 10th June. The Living Classroom at Bonsley will be open between 10am and 4pm daily, with a selection of traditional and contemporary crafts and art pieces on display. You are also more than welcome to come and enjoy the tranquillity of the woods! 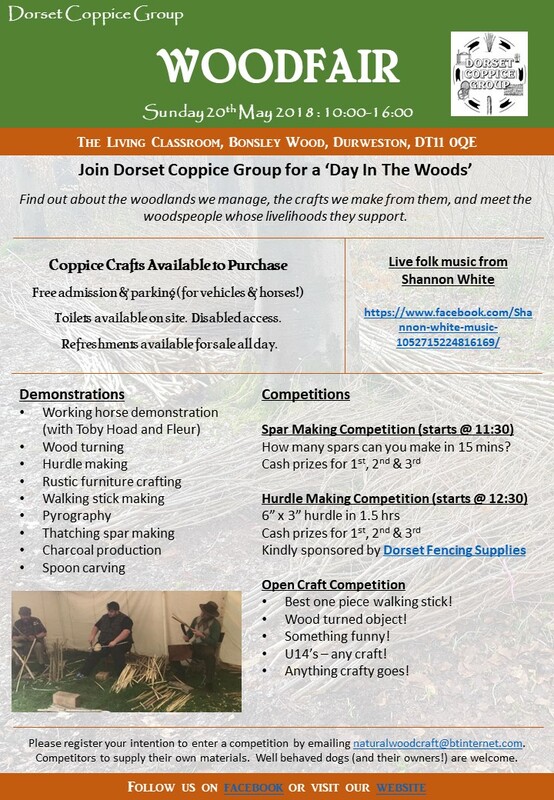 Details of Dorset Coppice Group’s 2018 Woodfair. To be held Sunday 20th May. Dorset Coppice Group is running a number of one day courses over the next six months on subjects related to coppicing, woodland crafts and sustainable woodland management. These are open to members and non-members alike. This “taster” day is a chance to learn the basic techniques of some traditional coppice crafts either to satisfy your curiosity, or as a prelude to a more in-depth course. There will be refreshments available but you may prefer to bring a packed lunch. There are toilet facilities & drinking water on site. The cost for the day is £40 and you can choose four different activities from the above list. Each session will last an hour and a half and will give you a taster of the craft. Many of the instructors also run day or two day courses, so you may want to put your name down for one. The Dorset Coppice Group Woodfair will be held at Bonsley Wood, Durweston on 6th May 2017. Competition entries 50p for non-members. Please contact David Ewers for more information. © Copyright Dorset Coppice Group 2013-2018. All Rights Reserved.